I was a stranger in a strange land. Gone were the familiar greens and blues. Everything was white. And cold. Very cold! I knew that it had been a harsh winter in Michigan. I heard about the polar vortex and kept current on conditions because our son and his family live there. But I was not prepared to be dropped into a setting of white. As we began our descent into Grand Rapids, this was my view. Close up was a lot more intimidating. Driving with snow drifts higher than your car is stranger than driving after Hurricane Irma left piles of debris along our Florida streets. Our Irma debris held on for over two months. I think the Michigan snow drifts might beat that. It was embarrassing finding myself commenting on the snow. As a Floridian, I’m used to people talking about the weather. Our summers are long and hot. The heat can be oppressive and unrelenting. And the rain – the rain can sneak up on you and be delivered not only downward but sideways in sheets that take all visibility away. But just as suddenly as it began, it can be gone. Snow is not like that. Snow stays and gets pushed around by convoys of plows. It gets piled high as an elephant’s eye. It gets dirty and then covered by fresh snow. The plows come day after day. The piles grow. Ice storms mess with your footing. You have to borrow boots from your daughter-in-law (thanks, Dacia!). You have the feeling that you don’t belong here. It’s otherworldly. So, comment I did. I couldn’t stop talking about how white everything was. My sweet daughter-in-law seemed amused by my snow befuddlement. I did grow up in Maryland. We had snow there. But not like this! I stared out the window in amazement. I couldn’t get over it. Finally, I realized I needed someone to help me with my culture shock, so I called in an expert – my four-year-old grandson. Felix loves snow. He was a little baffled by my lack of experience with it, so he offered his point of view. I figure if it’s a little too much snow for a four-year-old, it’s okay that it’s a lot too much for me. Look up the meaning of vortex. Play a drinking game. Whenever someone says “polar vortex” they have to take a shot of hot chocolate. Read. Something by Robert Frost would be appropriate. Watch movies, maybe something with a tropical theme or even The Polar Express might feel warmer than your current circumstances. 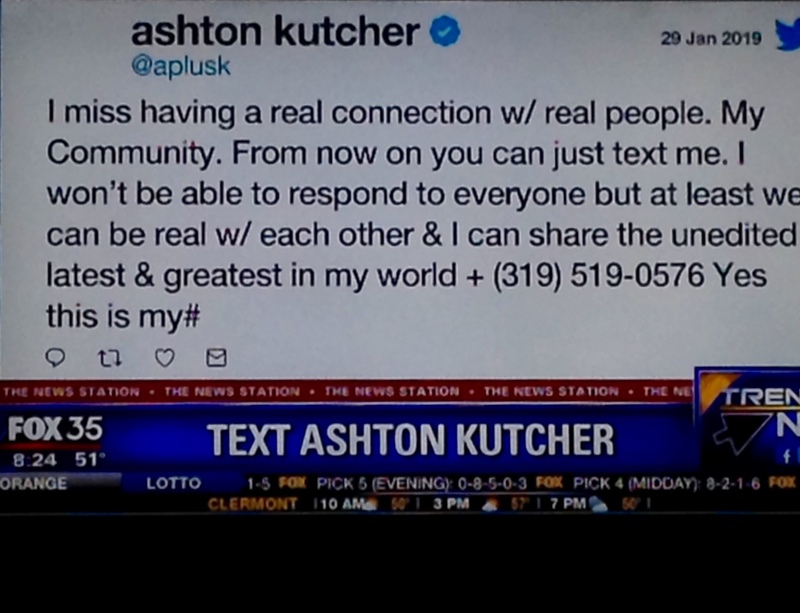 I caught this on the news this morning. Ashton, you’re killing me. You want us to be real with each other. You want connections. But your last line tells it all: You want to share your latest and greatest with us. Sounds a little one-way, if you ask me. Anyway, Ashton, thanks for the chuckle. After I started writing this, I contemplated texting you, but I was afraid you’d text me back. So, I checked with Google and it looks like you have taken your number down or changed it or something equally non-communicative as far as your community goes. Silly boy. Number 6 – Get excited about my post for tomorrow’s blog. I’m doing a give-away. On a serious note, I have family who are in Michigan, so I am praying that this dangerous cold weather passes through quickly and that people will be safe. Until tomorrow.